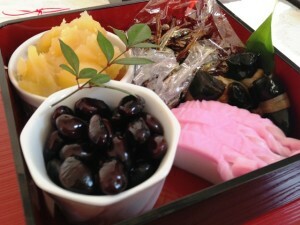 Osechi Ryori is dishes served at Oshogatsu (Jan. 1st) for celebrating the new year day(s). Normally it’s served from Jan 1st. to 3rd. These days are called as “Sanganichi.” Before Oshogatsu, mothers are busy to prepare the new year celebration, so many of dishes to be cooked which can be preserved for several days for that mothers don’t need to cook anything during Sanganichi. And each dishes has unique meanings to pray for luck for the year. 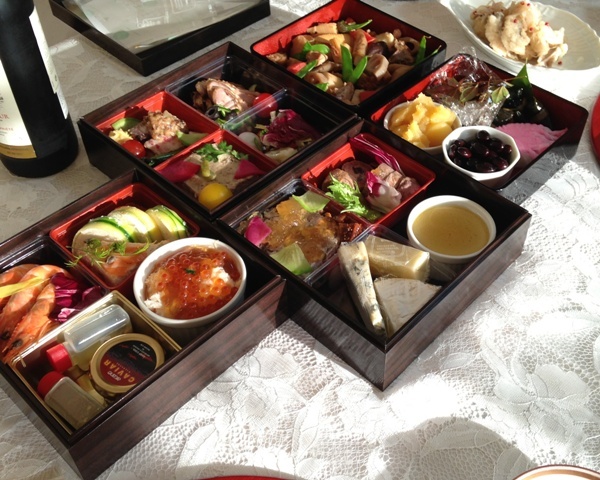 We enjoy Osechi Ryori at the new year party with family or friends. This year, my parents home prepared Osechi Ryori dishes like above photo. Now we can buy whole set of it which has already cooked. 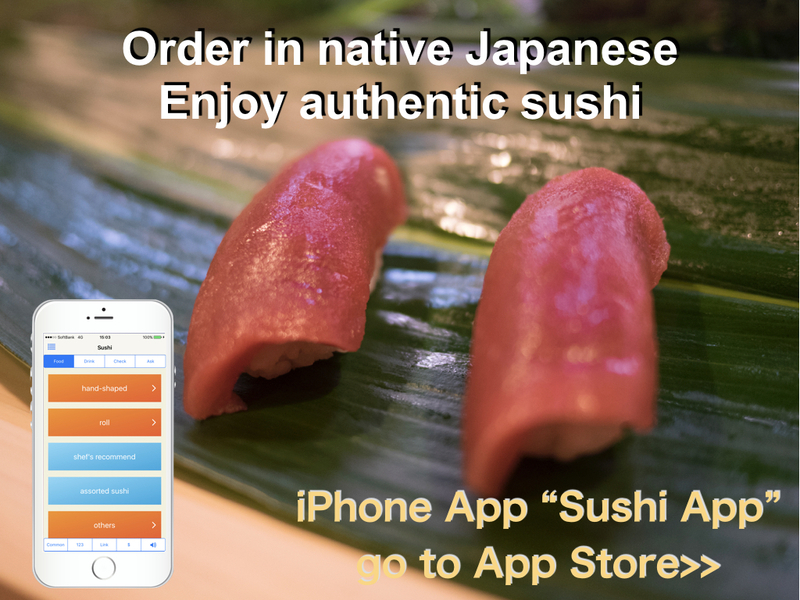 Many famous restaurants, not only Japanese restaurants, but also other countries’ restaurants are making such products. My parents home bought from French restaurant. It’s a French style Osechi and I like it. Also my home prepared some traditional Japanese Osechi dishes. 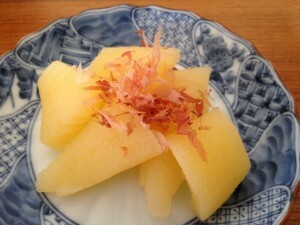 In this article, I would like to introduce some dishes and meanings which they have. Ozouni is the first food which most people eat at Jan 1st. It is a soup which has Mochi (rice cake) as a main ingredient. There are many different type of soup depends on region or home. Some are miso soup, and others are clear soup. Also base of broth or ingredients are different. The photo is Ozouni of my home. 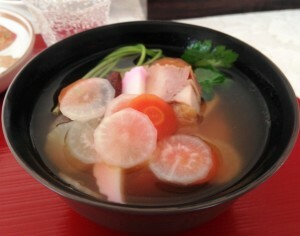 It is clear soup and ingredients are simmered chicken, rice cake, shiitake mushroom, kamaboko, carrot and daikon radish. It has many roes and has the meaning of fertility. Kazunoko is added the taste by broth (Bonito). It’s made from dried herring roe. First, it’s put in a water for several hours to make it soft. Then marinated in bonito broth. When eating, I usually add Katsuobushi (bonito falkes) and some soy saurce. Kuromame is a kind of soy beans and is most expensive one. The taste is a little sweet. This dish is cooked to simmer with soy sauce and sugar for long time. I think my family simmer it for more than 6 hours. Kamaboko is said to be expressed the sunrise. And Red and White Kamaboko are served together. Red one expresses blissful and happiness, and white one expressed sacred. Oshogatsu is also a day to welcome the god of the new year which protect all family to the home. So it’s a sacred day, too. This dish expresses treasure because of that color, gold. People pray for good economic situation for the year. Chest nuts can be found any area of Japan, and it’s a typical blessing from mountaion. 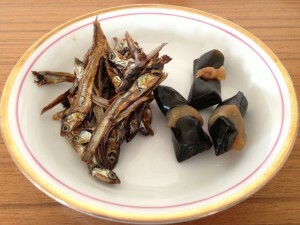 In the past, anchovy or sardine were used as fertilizer of the field. Tazukuri means to make rice field literally. People eat it to pray for a good harvest. Now we may be able to think harvest as the result of business. Kombu is a famous for the base of broth of Japanese food. It usually used as soup stock and is not eaten. But sometimes, we eat Kombu and this is one of those dishes. “Kombu” sounds like “Yorokobu” which means happy. 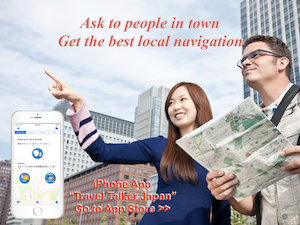 Oshogatsu is the day to celebrate new year and it’s a happy day. So Kombu Maki is one of indispensable food for Osechi Ryori . Tai sounds like Medetai (Blissful), so people eat it at celebration day. Prawn or shrimp is a symbol of long life because it has long beard. And also its shape which bended like old people’s hip. Buri is changed name during its growth. These fishes are called “Shusse Uo” which means promotion fish. People pray for their promotion. Normally, Ozouni is served for each person, but others are placed in a box shaped dish called “Oju” like top photo. We take some foods to each small dish. So we can enjoy many various foods step by step. If you have a chance to stay in Japan during Oshogatsu season, you may be able to try it at hotels.